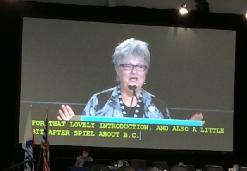 December, 2014 - BC FORUM President Diane Wood speaking to delegates at the 2014 BC Federation of Labour Convention in Vancouver. 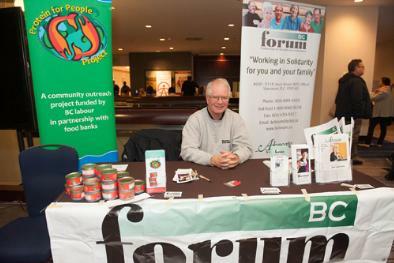 November, 2014 - BC FORUM Director Bill Silvester at the 2014 HEU Convention that took place at the Hyatt in Vancouver in November. 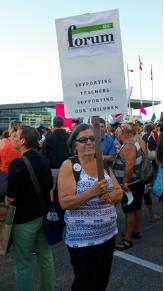 September, 2014 - BC FORUM’s Regional Representative Sandy Bauer at the Teacher’s Rally, September, 2014. 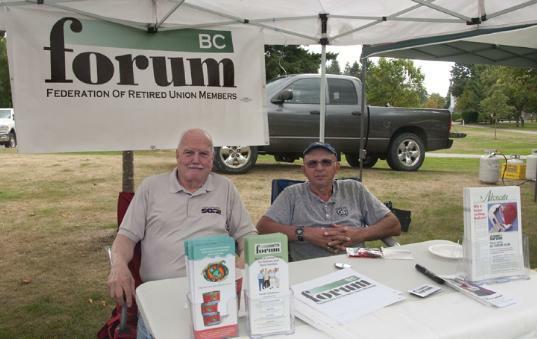 Labour Day, 2014 - Celebrating Labour Day 2014 in Abbotsford’s Mill Lake Park, BC FORUM Directors Gord Savard and Fred Girling attend the Fraser Valley Labour Council’s 5th Annual Labour Day Picnic. 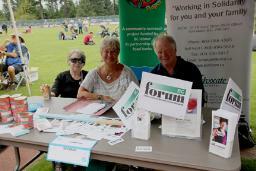 Labour Day, 2014 - Celebrating Labour Day 2014 in Burnaby’s Central Park, BC FORUM President Diane Wood, Secretary Miriam Olney and Vice President Bill Silvester attend the BC Federation of Labour, Vancouver District Labour Council and New Westminster & District Labour Council's Annual Labour Day Picnic. 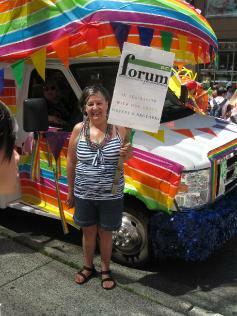 August, 2014 - BC FORUM’s Regional Representative Sandy Bauer at the Vancouver Pride Parade, August, 2014. 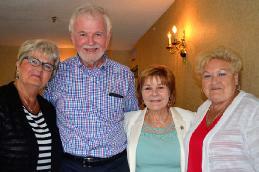 July, 2014 - Top photo: BC FORUM president Diane Wood at the 2014 CURC Executive Board Meeting in Toronto with, from left, Pat Kerwin, President CURC, MP Irene Mathysson and Louisette Hinton, CURC Executive Member. 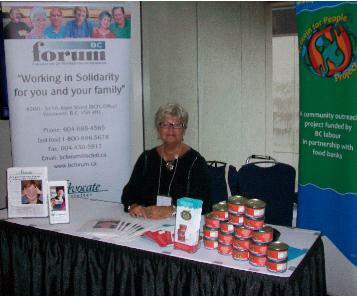 Bottom Photo: BC FORUM president Diane Wood at the 2014 CURC Executive Board members and guest MP Irene Mathysson. 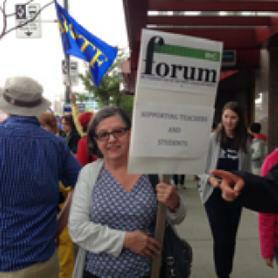 Sandy Bauer, BC FORUM Regional Rep, at demonstration supporting members of the BC Teachers Federation and students in front of the BCPSEA offices in Vancouver. 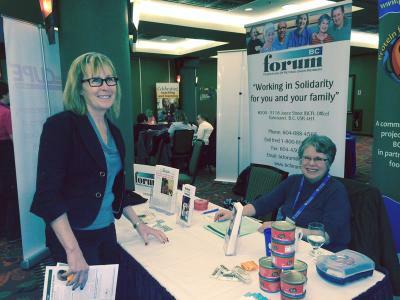 May, 2014 - Wendi Lawrence, former staff at BC FORUM, with Lorraine Logan, President, Council of Senior Citizens Organizations of BC (COSCO) and Diane Wood, President, BC Federation of Retired Union Members (BC FORUM) at BC FORUM information dislay booth, BCGEU Convention, May 30, 2014. 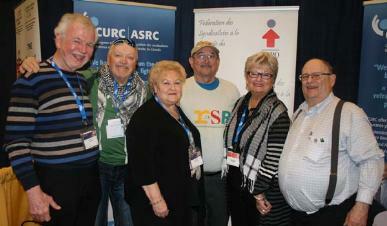 May, 2014 - BC FORUM president Diane Wood at the Congress of Union Retirees of Canada booth at the CLC Convention in Montreal, May, 2014, with Pat Kerwin, President of CURC, Louisette Hinton, Executive Member, CURC and supporters. Photo taken by Lorraine Endicott of Our Times magazine. 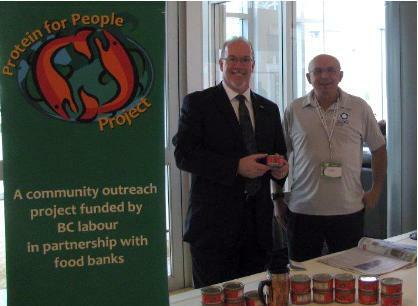 April, 2014 - MLA John Horgan with BC FORUM Board Director Gord Savard at the CUPE BC Convention in Vancouver, April, 2014. 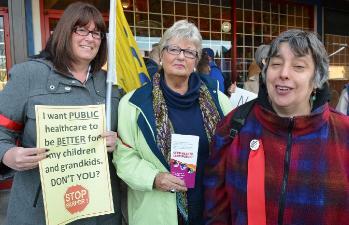 March, 2014 - BCFORUM president Diane Wood is joined by Stephanie Smith, BCGEU Treasurer and Marion Pollack, retired CUPW member and BC FORUM Board member at the Day of Action for a New Health Accord, Monday, March 31, 2014. 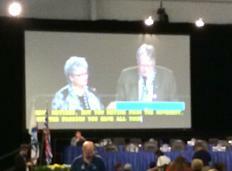 March, 2014 - Brother Russ St. Eloi, BC FORUM Board Director, with Sister Diane Wood, president, at the BC Building Trades Convention. 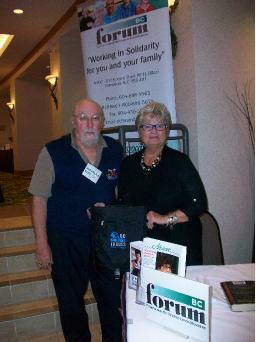 February, 2014 - BC FORUM Board Secretary Miriam Olney attended the BC FORUM booth at the 2014 Harrison Winter School and chatted with BCGEU activist Sandra Moran who stopped by for a visit. 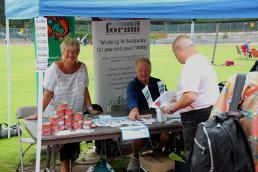 Thanks to Lorene Oikawa for sending in the photo. 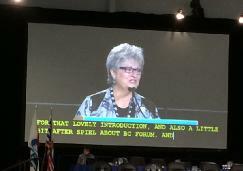 March, 2014 - BC FORUM Board President Diane Wood volunteered at the BC FORUM booth at the BC Teachers Federation Convention that took place in March, 2014.